Joining a long list of movies such as Unbreakable, The Italian Job, National Treasure, Unstoppable, The Dark Knight Rises, Jack Reacher, Silver Linings Playbook and the Rocky series, is Kevin Smith’s Clerks III, soon to film in Philadelphia, Pennsylvania early this summer. Through the Greater Philadelphia Film Office, Clerks III has already issued a crew call for the production. If all goes according to plan, Clerks III will be shooting in Philly for approximately five weeks beginning in early June. Love Park (or JFK Plaza) in downtown Philadelphia and the famous LOVE sculpture by artist Robert Indiana - image via Google. Written and directed by Kevin Smith, Clerks, the first film in the Clerks series, came out in 1994 and was made entirely in New Jersey. 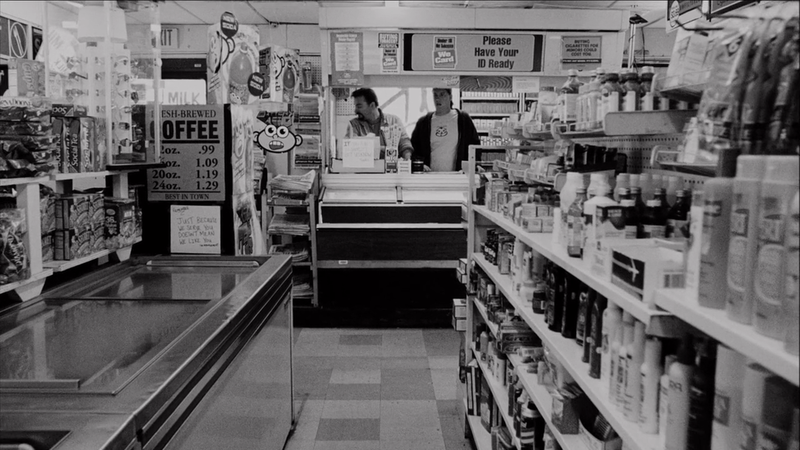 Shot in black and white, Smith made Clerks with less than $28,000 and filmed it at Quick Stop, a convenience store in Leonardo, New Jersey, where he was working at the time. Since Smith had to work at the store during the day, night time - between 10:30pm to 5:30am when the store was closed - was the only time he could film Clerks there. It's rumored that the director didn’t get more than an hour of sleep each night during the 21-day shoot. It was well worth it though. Clerks grossed over $3 million in theaters, thus launching Smith’s filmmaking career overnight. A scene from Clerks filmed on location at the Quick Stop convenience store in Leonardo, New Jersey where director Kevin Smith held his day job - image via Google. Considered a cult classic, Clerks won numerous awards including the “Award of the Youth,” the “Mercedes-Benz Award” at the 1994 Cannes Film Festival, and the “Filmmakers Trophy” award at the Sundance Film Festival. It was also nominated for three Independent Spirit Awards, and voted the 16th greatest comedy film of all time by Total Film magazine in 2000. In 2006, Empire magazine listed Clerks as the fourth great independent film. In 2008, Empire magazine called Clerks one of their “500 Greatest Movies of All-Time,” placing it 361st on the list. Clerks was also included in the book 1001 Movies You Must See Before You Die. More recently in 2014, Empire magazine places Clerks as number 169 of the "301 Greatest Movies Ever Made." A behind-the-scene look on the set of Silver Lining Playbook, also filmed in Philadelphia (at the Llanerch Diner in this scene), featuring Bradley Cooper and Jennifer Lawrence - image via Google. In 2006, Clerks II - also written and directed by Kevin Smith - was released. Partly filmed at the same convenience store used in Clerks, the sequel was also shot in other New Jersey locations and in California. Clerks II won the Audience Award at the 2006 Edinburgh International Film Festival. Smith’s Twitter announcement left little room for speculation as to where the next Clerks movie will be filming. The Pennsylvania film tax credit also helps solidify the film location. "There's no doubt that they would not be shooting the film in Philadelphia if they couldn't access the film tax credit," said Sharon Pinkenson, director of the Greater Philadelphia Film Office (which helped Smith apply for the credits). "The world has changed our business completely, and nobody shoots anything significant without chasing tax credits." Pinkenson also said that part of Clerks III will probably be filmed at the Philadelphia Soundstages in Olde Kensington. Pennsylvania’s film incentives include a 25% Tax Credit to productions that spend at least 60% of their total budget in the state. For more information on filming in Pennsylvania and Philadelphia, visit the Pennsylvania Film Office and the Greater Philadelphia Film Office. Clerks III, the third and probably final installment of Kevin Smith's Clerks series is slated for release in the summer of 2016. BANNER PHOTO CREDIT: Above photo of Kevin Smith, writer and director of the Clerks series - via Google.